Google AdSense is, along with Google AdWords, one of the products of the online advertising network from Google. Basically, it allows publishers to earn revenue by placing ads on their websites, whether text, graphic or rich media. These ads are administered by Google and organized in partnership with AdWords advertisers through a complex system of instant auction. AdSense and AdWords are the kings of online advertising because Google is the king of the network in terms of the flow of information is concerned. They are also easy to use systems, so that virtually everyone uses or has ever used to monetize your website based on advertising. Your network display (or AdWords Advertisers) is almost infinite and contextual advertising allows different formats and sizes, both text and graphics. The problem comes when the results are not satisfactory in terms of profits or intrusion on your website or blog, you are expelled from the platform by misuse (sometimes unreasonably) or simply think that monopoly by a single platform can not be good for your business. Also, some users have complained repeatedly lock their accounts just before the first payment, which is the least suspect. After offer some tips to improve your AdWords campaigns , we propose some alternatives to AdSense (some of them compatible with the Google platform) to test on your sites. Most of these alternatives provide payment of the ads or by CPM (cost per thousand impressions) or PPC (Pay Per Click). It is known to be widely used in some article directories. The good news is that there is only one option of advertising for your site, but provides a way to supplement with other advertising programs, but add different formats common to see in most of the sites, making it easier to integrate into any of your web space. Unlike Google Adsense, Chitika has an affiliate program that gives you the chance to win more money. The average payment per click on Chitika is around $ 0.15. Allows payment via PayPal and the minimum charge is $ 10. It also has a blog and a forum in which to resolve all your doubts. They define themselves as leaders in the in-text advertising links, with the most relevant ads and more profitable market. The ads are integrated into the content of the site, as shown overlapping content, so no need to use dedicated space, but this system can be annoying to some. Infolinks provides links as links to web content and get paid for each click that visitors make on advertising links to your website, but you have to reach a minimum of $ 100 to start collecting dividends. Supports payment through Paypal. Happens to be one of the best alternatives to Google AdSense. Conditions have considerably more flexible use AdSense and are much more receptive to small publishers and bloggers. Ad Brite gains are distributed in 75/25. The minimum payment on Ad Brite comes from the $ 5. A point against it is that it supports payment through Paypal. One of its weaknesses is that it has so far a lot of advertisers. LinkLift specializes in advertising on blogs, but only accept sites that have good PageRank or a significant number of visitors. Happens to be the platform for buying and selling advertising links highest-paying (also in euros). For example, with a PR5 blog can get 23 euros for each link, if you multiply that by the number of places (LinkLift advises no more than 4) will draw nearly 100 euros a month. The system is pretty good, once your site is accepted. After signing up on your system, they will reach one notification every time someone buys a bond. Payments can apply once you reach 30 euros in your account. Payments are made through PayPal, and take between 30 and 45 days to make the deposit in your bank account, Paypal or Mailbookers. Another good alternative, click payments are high enough to receive a decent income. Clicksor also add as many sites as you want and domains on one account. Clicksor payments are a minimum of $ 20 to $ 50 for Paypal and bank checks. AdLemons Spanish is a platform designed to monetize blogs by managing their advertising, exploiting their natural microsegmentation offer a new path from which advertisers make effective branding. Try to provide a new source of revenue to publishers beyond the typical options AdSense advertising or CPM. This platform is based on several relevant parameters in the blogosphere. Its called as \'LemonRank\' helps advertisers to better understand the quality / price ratio, the ratio also known heretofore as \"Cost of influence.\"
To further ease of use and have WordPress plugin for Google Chrome application. After registering, you install the widget for your blog or site and the links will be auto sales. The system control panel is simple and easy to use. It is recommended for sites with good PageRank (from 4) and can earn approximately $ 4 for every link (recommended between 12-15 per site). Payments are made through PayPal at the end of the month and so have its users, without any delay as in other platforms. Coguan is another Spanish company specialized in optimizing advertising revenue through the web. Just last month, has announced its international collaboration with the Google Ad Exchange (real-time market that helps ad networks to maximize ROI of websites) with the goal of increasing by 22% the effective cost per thousand impressions (eCPM) of Internet advertising to its customers over the next six months. They plan to close partnerships with more than half of the 25 major media in Spain by the end of 2012. From 2013 the company will begin to strengthen its existing partnerships with carriers outside Spain, focusing on European and Latin markets with higher growth potential. Puxee can sell advertising directly to advertisers. The advantage of this about Adsense is that you can set a fixed price monthly advertising space on your website, instead of relying on the variable amount is received through PPC networks. Bidvertiser accepts all kinds of places, so it is quite easy for your site to be accepted. It offers text ads and advertising feeds, although customization of ads is quite difficult if you have too many sites where utiizarlos. To block ads that do not consider appropriate for your site. The payment occurs within a month after reaching the minimum income required and supports Paypal and other payment options. This company deals directly with the brands they endorse, and although it is not easy to be accepted when it is already in the product options are extensive and can choose one suitable for our site. Perhaps the downside is that as it deals directly with the companies, you can get to take several weeks to accept our request in some programs advertisers. Many of the company\'s pay-per-click and sale, but only taken into account for the Spanish visitors. Payments are by bank transfer in euros. This is a recommended site for blogs, allowing the buying and selling of links to posts. It is in English but in other languages ​​online sites. With good PageRank will reach at least a pair of requests every month. The posts can be written in Spanish and you just have to add the links you provide. They also offer the opportunity to write sponsored posts. The payment takes place every two weeks and do not have PayPal shipping threshold. 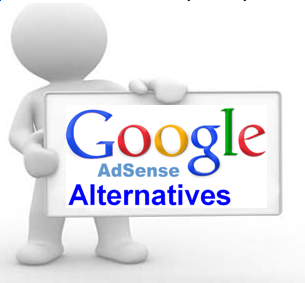 Do you think there really are real alternatives to AdSense? What other advertising platforms or programs you use to monetize your website or blog?